As with many things involving small children, a little bit goes a long way when it comes to visiting a gallery or a museum. 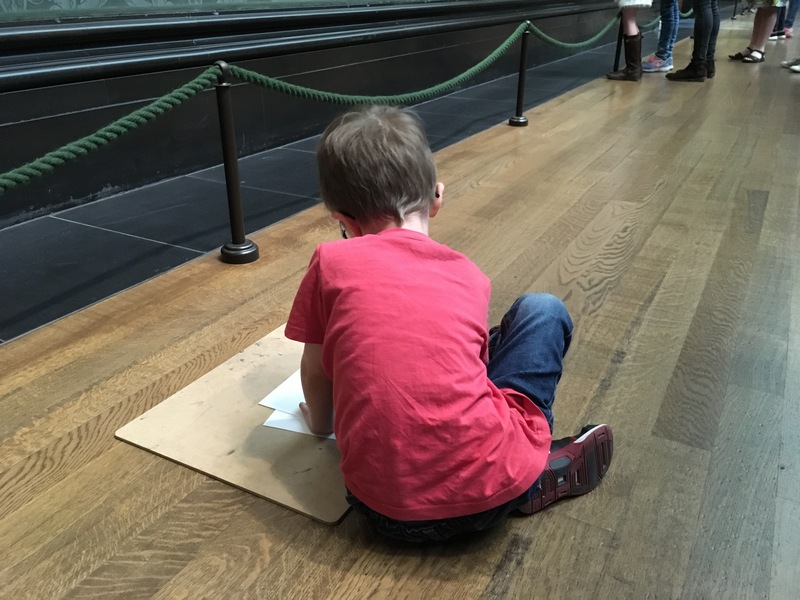 I took my two boys, aged five and three, to the National Gallery in London over May half term. It is a vast place with over 2,000 international works of art dating from the 13th century to 1900 so it’s a good idea to either focus on a particular art movement such as Impressionism or a theme such as paintings depicting mythical beasts. Alternatively, you can join one of the Gallery’s free activities. The Gallery’s website has other suggestions on how to tackle the collection with kids. After reading Katie and the Bathers by James Mayhew, we’d tried some Pointillism paintings at home so I was keen to show my five year old some of these at the gallery. Unfortunately, aside from Bathers at Asnieres by George Seurat, on the day of our visit the room housing most of the Pointillism paintings we wanted to see was closed so we headed for the free half term activity instead. The theme of the workshop was landscapes and children were invited to create a three dimensional secret garden with creatures sketched from paintings they had to locate from around the gallery. This was great fun as we had the room number and a small image of each painting to find. The children were given colouring pencils and a large wooden board with paper for their sketches. After this, my son created his garden with the assistance of several artists, he really enjoyed the experience. The workshop was open for a number of hours so children could drop in and spend as long or as little time as they desired on their artwork. I was impressed by how many people were on hand to help the budding young artists and also their backgrounds: one of the artists who assisted my son was a professional landscape painter. If you’re visiting the National Gallery with young children, I would highly recommend reading some of James Mayhew’s brilliant Katie books beforehand as they feature several paintings from the Gallery. I had wondered whether the Gallery might be too big and serious for a five year old but this was not the case. Whilst wandering around looking at the paintings on our workshop list, I was really impressed that my son recognised a number of paintings from Katie and the British Artists including Gainsborough’s The Painter’s Daughters with a Cat. 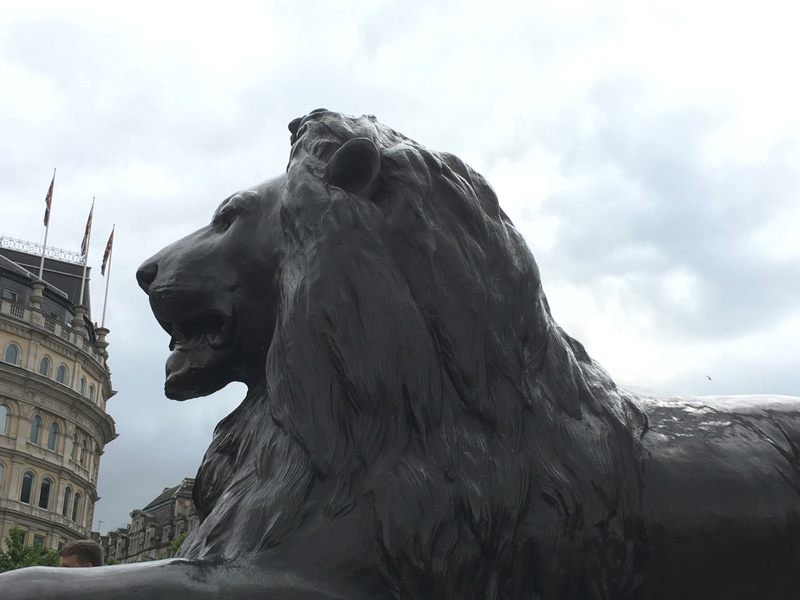 He was also keen to see the lions in Trafalgar Square after reading about them in another Katie book. 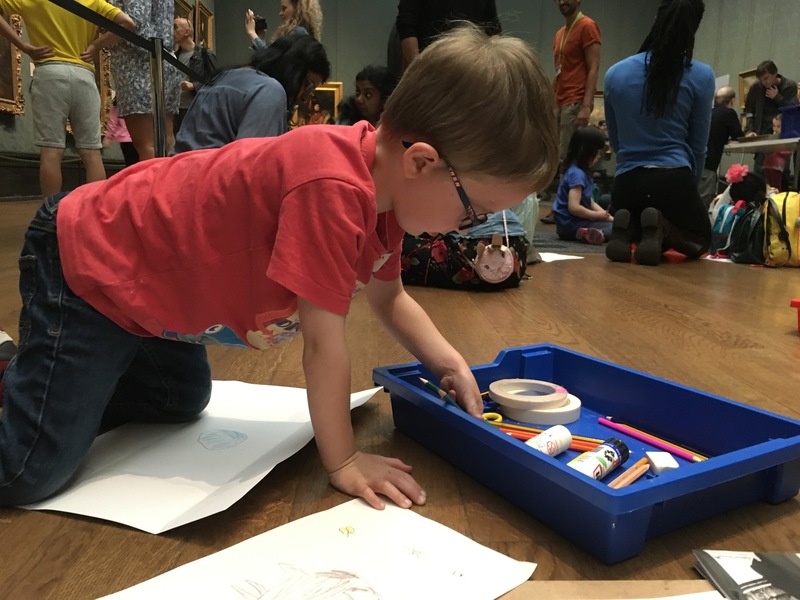 There are plenty of free family activities on during term time as well as during the school holidays making the Gallery an extremely child-friendly and good value destination. We will definitely be returning during the summer holidays. 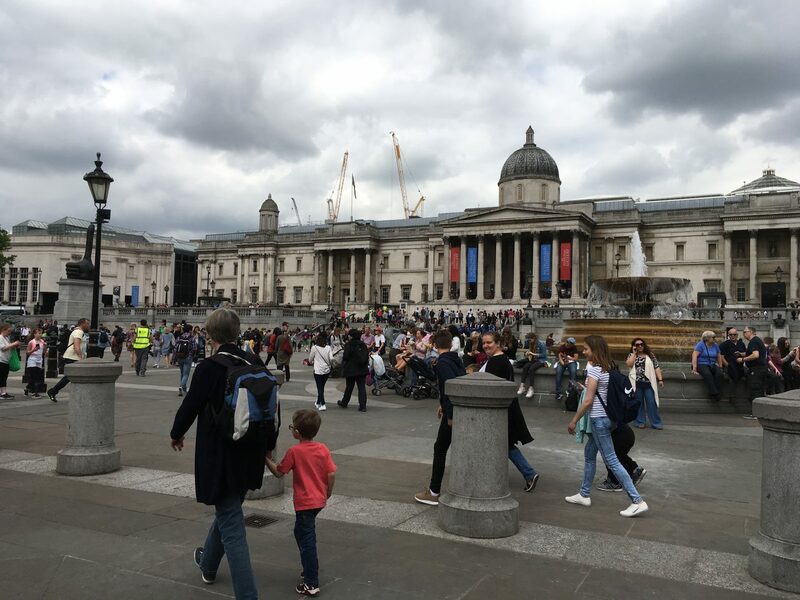 Accessibility: there is a wheelchair and buggy-friendly entrance to the right of the main Trafalgar Square entrance. There are lifts inside the Gallery. Refreshments: there are three separate eateries although we ended up eating a packed lunch on a sofa just outside the basement café which didn’t seem to be a problem. Tip: check that the paintings you want to see are available before making the trip! Yes, I’d expected them to be volunteers. Good to know there’s potentially still a job out there for art students! That’s great. We’ve visited and done some sketching off our own bat, but that activity sounds really well thought out and interesting. Must check them out this summer. Like the sound of the Katie books too. My kids have a game involving pictures from one of the galleries near us, and I was surprised by how much they got into it and how much they can tell me about each picture now. Yes, the activities are a great way to introduce them to galleries I think. Defo check out the Katie books and have a read of my review about the James Mathew Vivaldi concert we went to: really brilliant! I’ve never read the Katie books and we’ve never tried one of the workshops (though I’ve seen them and they always look good), but we have done quite a few of the free curator talks with the kids. They are really fab, you only see 4-5 paintings and there is usually a theme that becomes apparent as you go from one room to another. I like to take every out of town guest to these as they are a real find and a great way to discover what could be an overwhelming art visit. Brilliant! I might try one of the curator talks next time… depending on what my 3 yr old is up to! That’s amazing work by your daughter. Love that you managed to act cool about it! The Katie books are brilliant, I was really surprised my son recognised a Gainsborough painting, the books are so effective!